Hong Kong, Avenue of Stars, people making photos against stature of cinema crew. Tourists posing for photos and selfies in front of a bronze statue of Bruce Lee near the waterfront at Tsim Sha Tsui. Bruce Lee lenticular card for sale at Cat Street (Lascar Row) in Hong Kong. 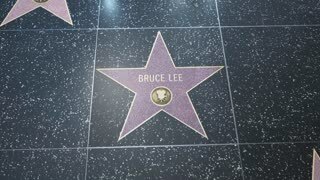 Cityscape, Hong Kong, Avenue of Stars, people making photos against stature of Bruce Lee. Steadicam. HONG KONG, CHINA - CIRCA JUNE 2014: Bruce Lee statue at the Avenue of Stars.